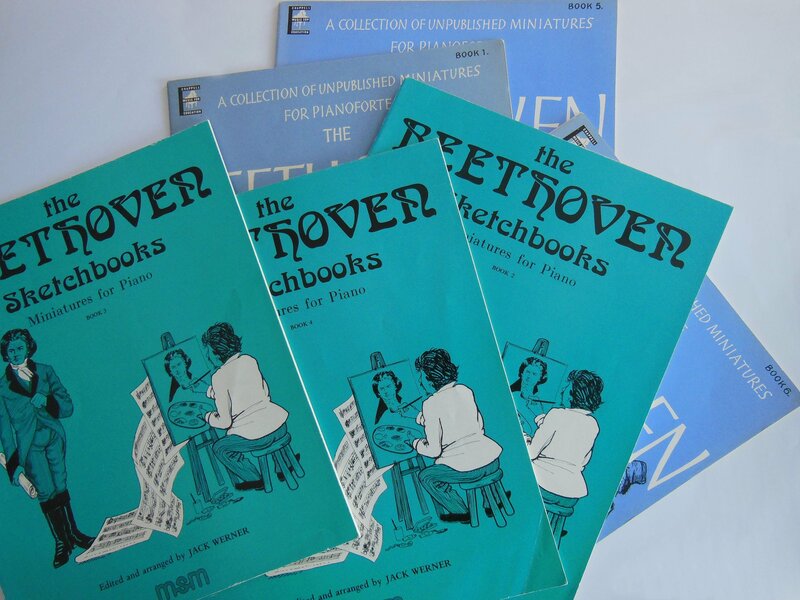 Jack Werner – The Beethoven Sketchbook – Miniatures for piano. Dalla metà degli anni ’60 da MSM Music publisher di Londra incominciò a pubblicare delle partiture di Beethoven, a cura di Jack Werner, per diversi gradi di studio del pianoforte. Werner prese a piene mani gli abbozzi beethoveniani, per farne brevi pezzi. Quando necessario, ho diviso gli abbozzi non congrui che Werner fuse per creare esercizi; per questo motivo vedrete dei numeri doppi. Non ho eliminato invece i risibili titoli originali. Purtroppo, il compositore non indica le singole sorgenti degli abbozzi, ma i suoi riferimenti sono il Kafka, il Kessler, i manoscritti della Preussische, ecc… ecco le parole di presentazione presenti sui singoli volumi. Buon divertimento! The Beethoven Sketchbooks are remarkable relics of a very great composer, and perhaps the most human documents ever left by a musical genius. The study of these Sketchbooks gives one an insight into Beethoven’s method of composition, his incessant toil and the pains bestowed on works great and small, the imprint of a powerful individuality searching for the ideal way of expression, and, after the greatest of efforts, finding the form that seemed the last word on the subject. On the other hand there are many charming ideas in the Sketchbooks that have been passed over; whether through lack of time, or because there were more important matters on his mind, we do not know. There is always a regret that these little subject gems did not appear as Bagatelles, or in Sonatina form. How charming and useful they would be to the young student. The question has often come to mind, could one, dare one, use these sketches as the foundation of little pieces?Now at last Mr. Jack Werner has with courage, scholarship and the greatest respect presented many of these sketches in a suitable form for the student. He has not for a moment imposed his personal idiom on the little ideas, but on the contrary he has presented them in a manner closely allied to Beethoven’s own settings and style, and in this way I think that he has justified his great enterprise and given us an entrancing set of pieces. The Beethoven Sketchbook – Miniatures for piano.